This is an easy way of witnessing for Christ - but it may cost you a dollar or two. This applies especially to coffee drinkers who go through coffee-shop drive thrus. Sure, if you are loaded or flush with cash, it will work at any drive thru as long as you are prepared to pay for more than a cup of coffee for the folks behind you. You can do this anytime and without having anything on the back of your vehicle to indicate you are a Christian. You can do it out of just sheer generosity. But if you would like to connect a surprise act of kindness with your faith in Christ - then you will need something on the back of your car to indicate that you are a Christian. It could be a simple fish symbol or a cross - symbols that are universally associated with Christianity. Or it could be a non-tacky bumper-sticker. Perhaps you could have your own tasteful bumper-sticker made up at a local sign shop that simply says: "A Christian" or "The Bible" or "John3:16". Or if the local assembly of Christians has its own website, the bumper-sticker could be the website address. Sometimes a bumper-sticker can be negatively provocative which we should avoid. There is a slight difference between one that says: "I'm a Christian!" and one that simple states: "A Christian". One could be mistaken for arrogance. Here's how it works: so you are craving a coffee or cappuccino or a hot tea. 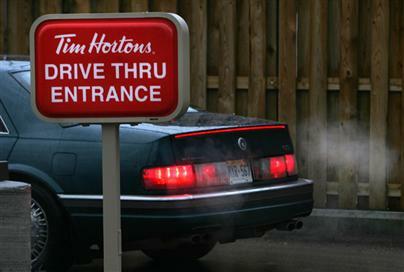 You go through your favorite drive-thru and place your order. 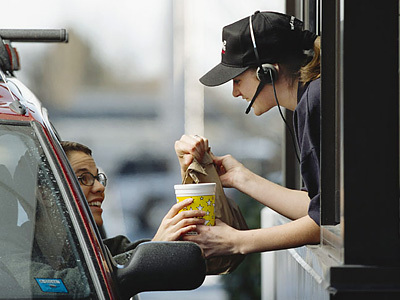 You look in your rear-view mirror and see another person or a couple placing their order. You have some cash on you and you decide to do it. They have been staring at your Christian identity on your bumper or your trunk. You get to the window to pick up your coffee and pay for it. With a smile, you say to the worker, "Oh, I'd like to pay for the folks (or friends or the car) behind me too." The worker takes a second to add the two totals together and then gives you the new amount. You do a simple calculation to add a tip to the total amount of the two vehicles - and give the cash and tip to the worker - along with a pen or a cd or something. You drive away sipping your drink. The driver behind you moves up to the window and the worker says - "No Charge. The guy ahead of you just paid for your order." 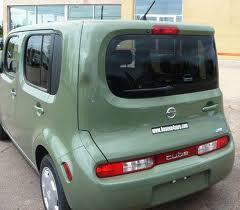 The driver shakes his/her head and thinks: "Wow! That's cool." Don't expect them to race down the road and wave frantically out the window thanking you for your generosity - but you can be sure of this: the driver noticed your deed and appreciated your kindness. AND, if you had something on the back of your vehicle to indicate you are a Christian - the driver would mull that over in her mind and make the connection between your kindness and your message. Probably the worker at the drive-thru window saw her reaction. You don't need to see it; just understand that it was well received! When the story gets told by the driver it may go something like this: "I was in this drive thru and I was getting impatient. The car ahead of me had one of those Christian stickers on the back of their car and quite frankly, the mood I was in, it bugged me. But then, when I went to pay for my coffee and donut, the worker said: "Oh, the guy ahead of you paid for yours!" I actually felt guilty. It was pretty cool." Perhaps your deed of kindness may melt a hard heart who has been hurt by a Christian in the past. Your act of generosity may reverse or counter the negative image that driver had after watching so-called Christians 'protesting' on the evening news last night. Can you afford to do this? Maybe not because not everyone orders just a single coffee. A driver might order a sandwich and a coffee and that will cost you $6. But if you have $10 - you will be prepared. However, most of the time, when you look in your rear-view mirror and decide to do it - you won't be hit with a huge bill. Use your head. If you look in the mirror and you see a bus or a loaded van or six people squeezed into a car - and you are not feeling rich - then it is probably not the time to say: "I want to pay for the folks behind me." Yes, Christmas is a good time to do it. It is nice when unbelievers associated the Christian faith with GIVING and KINDNESS and GENEROSITY. But, it could be a work for the Lord you do all through the year if you have a few extra dollars floating around. Think of the positive impact on others even if you dedicated $10 a week to such an effort.